Yes, it is last minute however we wanted to give our lovely readers one more gift this year. We hope you enjoy these pretty botanical new year tags. There are sketches of a peony, cherry blossoms and a water lily. They are 3 inch squares with crop-marks on the front side to make cutting more fun :). They can be used as gift-tags, sticky notes, letter enclosures, for journaling, as planner elements and pages (try the reverse side as washi-tape! ), bookmarks, thank you notes and love letters! Thank you so much for following our blog this year! We plan to post more content in 2019 and we hope you will join us! You are always welcome here. PS leave a comment, we love comments and yours will make this the most wonderful post ever! How have you been? Any new adventures lately? Have you started new projects, learned a new language or traveled to a new country? Have you written any letters lately? There is something exceptionally heart-warming about holding a letter in your hands, words from a friend, written just for you. The new year is a great time to send a few hand-written letters. Connect with someone, share the excitement going on in your life, and let them know how much they mean to you. We have created this cute fold-over stationery to share with you, as our gift. 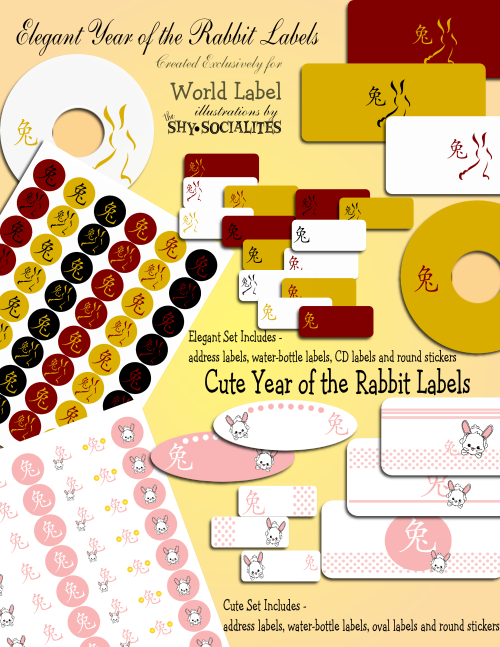 The illustrations are exclusive to Shy Socialites, brand new drawing we create of a fun kitten, designed to resemble a Maneki-Neko good-fortune cat, along with cute paw prints and golden fish! The fold over design in create to be printed on 8.5 by 11 inch paper, page 1 is the front & back, and page 2 is the interior, no cutting required. The front features the kitty climbing over the page, the back is, well the back of the kitty. -When printing, if you computer prints double-sided make sure you are are NOT printing duplex. -When folded in half then into thirds these fit your standard stationary-size envelopes. Feel free to print as many as you wish, you can get them by click RIGHT HERE. Want some coordinating clipart to make stickers with? Leave a message on this post AND write to info@shysocialites.com requesting the “fortune kitty clip-art”. We've got lots of fabulous business card templates in our Shy Stationery Shop! Here are a few of our favorites. Don't see what you are looking for? Let us know. We can create stationery just for you using any of our exsisiting designs! The Gift Table Business Card Templates by shystationery Design your own custom size business cards at zazzle.com. Jars with Pink Candy Business Card by shystationery Create business cards online at Zazzle. Puppy Tangle Business Cards by shystationery Order business cards from Zazzle. Birds Night Out in Appletini-Color Business Cards by shystationery Shop for other business card templates free at Zazzle. Summer Owl Book & Journal Set by Trillustrations! It is almost time for Summer reading, this set is perfect for girls and boys of any age :) Includes 6 book plates (2 of each design) 4 different bookmarks and 2 journal pages. It is a free gift PDF file, write to tricia@shysocialites.com to request the Summer Owl set and please let her know the Shy Socialites sent you! What books are you planning to read this Summer? How about your kids? This set was created at the request of a Summer Camp counselor for her girls, I invite all camp counselors to enjoy this fun set! These sweet invites are just in time for spring! Perfect for a bridal shower, baby shower or birthday party!!! WIN a custom set from our NEW Spring line! We are getting ready to reveal our new Spring line, it is colorful, fresh, fun and delightful! To celebrate we want to create a custom PDF set for one of our fabulous readers from one of our new designs. After much thought we chose 3 very different sets from which you can choose. If you choose Tridot you will get a fun and playful mix of a 3-layered dot with a matching stripe. You can choose any 2 colors you wish (to be paired with white) for this fun and funky design. Should you choose Dolphin Mosaic you get a whimsical dolphin silhouette paired with an artistic mosaic pattern, You may choose 1 or 2 colors for this set. No matter which you choose we will work with your colors adjusting them lighter and darker to make a delightful play of shades and tones. You will receive your set in a PDF file you can print at home, or your local Printer. Each set comes with either an invitation or a flat stationery card (if you are not planning a party any time soon). You can choose all the text, we are even here to help you if you get stuck. Your card can be 5x7, 5.5 x 4.25 or a 5 inch square. In addition to all this, you get our skilled design and illustration team to help you create exactly what you are looking for! Now, here is what you need to do to enter. Visit one of these stores- The Shy Socialites The Shy Socialittles The Candy Store or Trillustrations Choose an item you like for SPRING! Post on this blog or the Trillustrations blog letting us know which item you chose! Want a second chance to win? Invite a friend and have your friend note that you sent her/him (you friend must also choose an item they like). Invite as many friends as you wish! This contest will be open until February 1, 2011. If we get 100 entries, there will be a special printable for everyone! If we get 150 entries, we will create a clip-art set for everyone as well! What are two great gifts to give this holiday season? Why, comfort and joy of course! In honor of those two fabulous gifts, we have created two gifts for you. First for comfort these "comfort and joy tags" - use a standard single hole punch and ribbon to tie one to a bottle of wine (comfort and joy, and for great wine gift ideas, ask Bobbie) a container of hot cocoa-mix, or perhaps something warm and comforting like a hand-knit scarf or mittens. To help create joy, these 1 inch mint-candy circles- punch them out with a one inch punch (need one? You can get one at a craft store like Micheal's, or you can order one here) you can even cut them out with scissors if you like. Scatter these little bit of joy everywhere, hang them from your tree, make a garland, toss them in the air like confetti, we do not mind, do whatever you wish, as long as it brings joy! Some of you may be looking at these thinking...hey that is the Peppermint and Spearmint collection, and you would be right! Bobbie an I are working on your fantastic party set as I type (Okay Bobbie is, I am typing). We still do not have a winning theme set chosen, so if you have not voted yet, please do (click here for a quick trip to the choices), and get a FREE gift for voting! Let's make this blog-a-zine fun and interactive, share a post here about something that brings you comfort or joy or both!